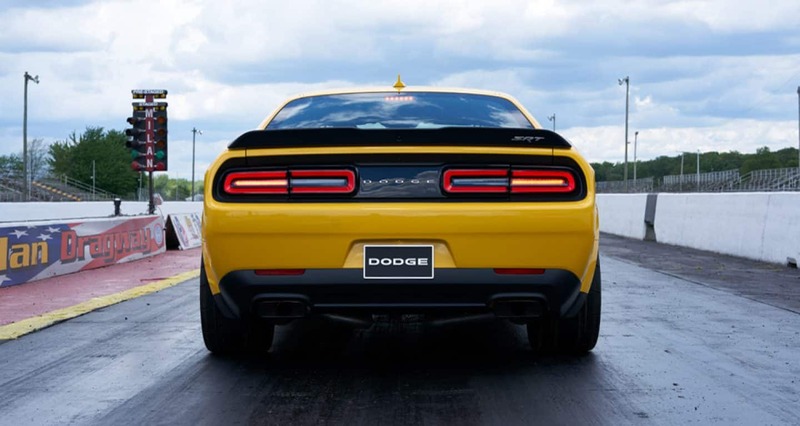 With the most powerful lineup yet, the 2018 Dodge Challenger returns. There are many exciting upgrades to the lineup, which already offered the most powerful V8 on the market, bold styling, advanced technology features, and a five-star overall safety rating from the NHTSA. What's new for the 2018 model year Dodge Challenger? 2018 brings some significant changes to the Dodge Challenger. 2018 marks the first full year of production for the Dodge Challenger GT, the world's first and only all-wheel-drive American muscle coupe. 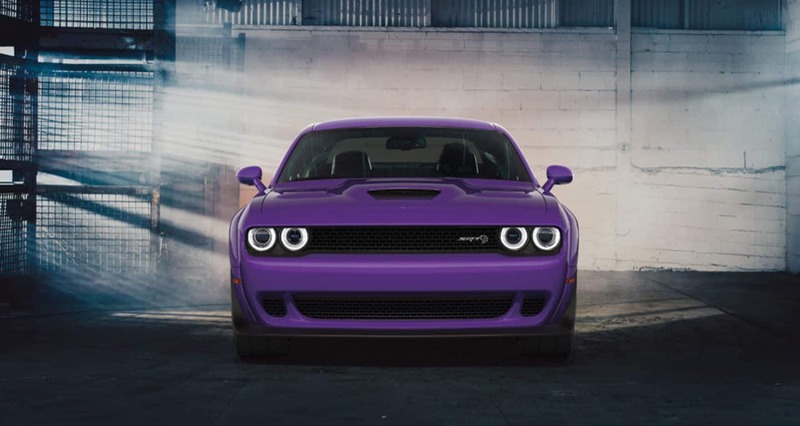 The GT boasts a high-performance all-wheel-drive system, deluxe Challenger technology features, and the smooth power of the coveted 3.6-liter Pentastar V6. There are two all-new trim levels for 2018 as well: the Dodge Challenger SRT Hellcat Widebody and the Dodge Challenger SRT Demon, both discussed below. All SRT Hellcats now feature new badging on the grille and fender. The SRT Hellcat also provides a new red IP badge and illuminated Air-Catcher headlights that feature the Hellcat logo. The Hellcat is also eligible for a new Matte Vapor wheel finish, a Demonic Red Laguna leather interior, and black, gunmetal, and orange Brembo brake calipers. There are also new standard Low Gloss Black 5Deep light-weight aluminum wheels available for SRT models, cutting a total of 16 pounds from each vehicle. R/T and R/T 392 models offer the option of red Brembo brake calipers. Any Challenger equipped with the 5.7-liter engine may also be fitted with an all-new Performance Handling Package with upgraded four-piston Brembo brakes and a suspension tuned for supreme performance. While some models are still fitted with an 8.4-inch touchscreen interface, the new standard interface is a 7-inch touchscreen complete with Apple CarPlay, Android Auto, and a backup camera. What are the 2018 Dodge Challenger SRT Demon and 2018 Dodge Challenger SRT Hellcat Widebody? The all-new 2018 Dodge Challenger SRT Demon and SRT Hellcat Widebody are trim levels that make the lineup more powerful than ever before. The top of the lineup is now occupied by the SRT Demon, the world's first factory production drag car. It boasts an improved 6.2-liter supercharged HEMI Demon V8 engine capable of unleashing 840 horsepower and 770 pound-feet of torque; numbers that earn it the title of most-powerful muscle car ever and allow it to achieve the world's fastest quarter-mile in a production car, coming in at only 9.65 seconds. It can accelerate from 0 to 60 in a mere 2.3 seconds. The SRT Demon also achieves many production-car firsts, including being designed to operate on 100+ high-octane unleaded fuel, offering TransBrake and Torque Reserve, being built with front passenger seat delete, and achieving front-wheel lift measured and certified at 2.92 feet by Guinness World Records. 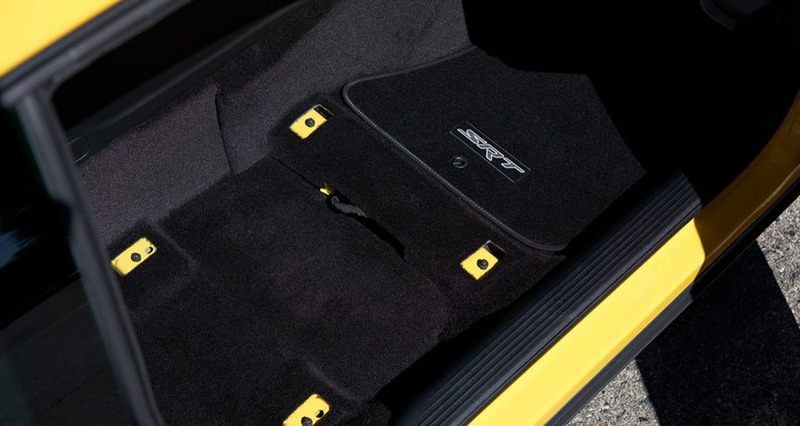 The 2018 Dodge Challenger SRT Hellcat Widebody adapts the traditional SRT Hellcat by adding the same fender flares featured on the Demon (adding a total of 3.5 inches to the width of the coupe), an electronic power steering system with selectable SRT Drive Modes, and 20 x 11-inch Devil's Rim split-five spoke aluminum wheels with extra-grippy 305/35ZR20 Pirelli P-Zero performance tires. The SRT Hellcat Widebody also features performance improvements when compared to the SRT Hellcat. What exterior paint colors are available for the 2018 Dodge Challenger? A total of 15 exterior paint colors are available for the 2018 Dodge Challenger. Four paint colors have been added to the lineup for this model year: F8 Green, IndiGO Blue, B5 Blue, and Plum Crazy. Returning colors include Billet Silver Metallic, Destroyer Grey, Yellow Jacket, TorRed, Redline Tri-Coat, White Knuckle, Granite Crystal Metallic, Go Mango, Pitch Black, Maximum Steel Metallic, and Octane Red. Ready to pick your perfect Challenger? With 16 models, 15 paint colors, and 5 engines, the opportunities for the 2018 Dodge Challenger are endless. Contact us now to find your perfect American muscle car!